We are building out our library of bundled macros. Prior to release, this is driven mostly by what we require. Let us know what would be useful to you. Longer-term, the intention is that you can build on these macros yourself. This macro is similar to the include page macro, but allows you to select a specific version of the page to include. This is great for reports and proposals, because you can create a space that consists only of boilerplate, and if you’re lucky your report will not be much more than a combination of includes. The problem with this macro is that people may not be aware that the page they are editing is being included in several other pages, and may make inappropriate edits. This macro, along with the includes report macro, lets you easily control that. By default, when including a page using this macro it will default to the number of the latest version. There is an additional option Latest, which simply tracks the latest version. When this option is used it becomes identical to the standard Include Page macro. You can use the macro browser preview functionality to view the results of including the different versions. If you have many instances of the include page macro on a page, it would be painful to manually update them. A REST endpoint is included which will convert all instances of include page to include version. The version number is specified to be the current latest version, so the page contents should be identical (until one of the includes is modified). The condition code is the Current page contains particular macros sample, with cheese changed to include. Once configured it will appear as below, but only on those pages that contain the include page macro. This macro is used in conjunction with the include version macro. It will show you which includes have later versions, with links to the diffs so that you can easily see what version you want to update to, if any. It also provides a button to Update All, which will update all includes to the version number of the latest version (check the diffs first to make sure this is what you want). When used it will create and save a new version of the current page - you can always roll it back if it wasn’t the result you wanted. To display this macro best you could put it in a panel macro. If you are writing reports for customers, you probably don’t want them to see this information - so put the panel in a NoPrint user macro. This macro executes the provided CQL query and returns the results as links to pages. It can useful to show the results of complex queries on pages, or labels etc. Various improvements are expected in this macro in the near future. Typically you would want to include some Markdown from a Gist or from Github on a page. In GitHub you need to click on the Raw button to get the URL to the original Markdown file. 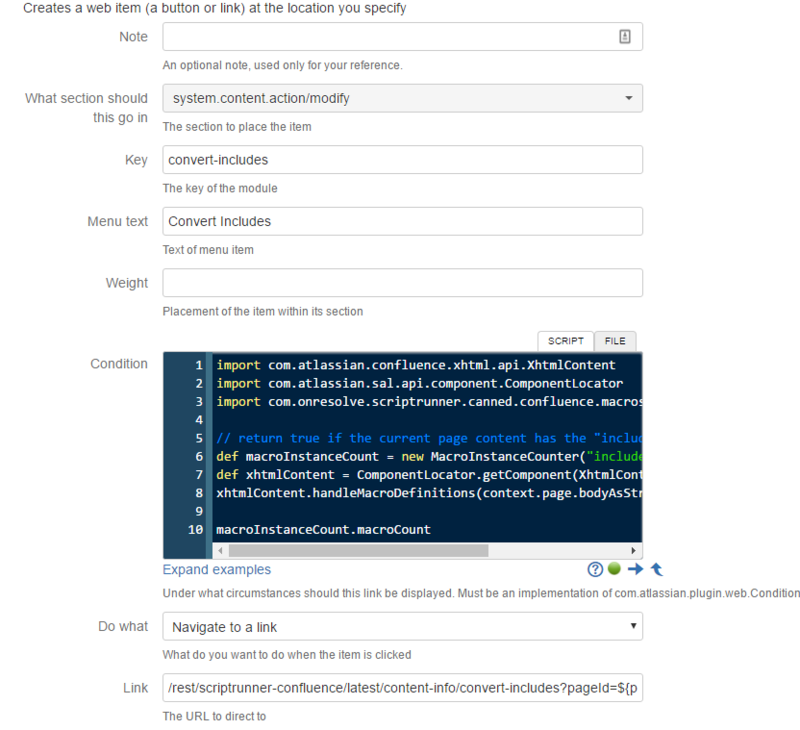 If you want to display Markdown from another Atlassian product, for example Bitbucket Server then the macro will automatically detect if you have an application link setup for the url you have entered and use it to retrieve the content. If you place Markdown in the body of the macro and you provide a URL, the URL will be ignored. This macro only supports the CommonMark specification of Markdown which means different flavours of the Markdown specification may not render correctly. If after upgrading you want to use the "Markdown in the body" functionality for an existing macro, you may need to edit and save the macro, or alternatively create a new macro. 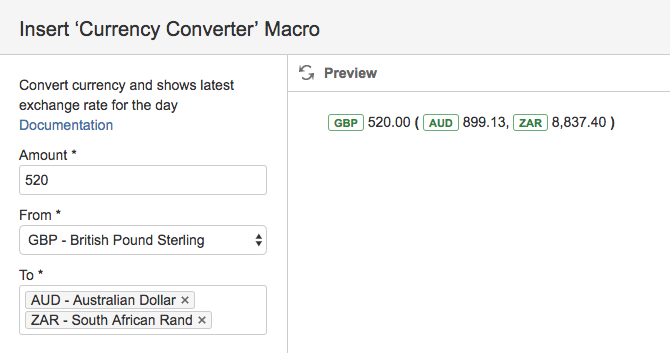 This simple macro converts an amount of money to multiple target currencies based on the last close of day exchange rate. It uses European Central Bank exchange rates. Previously (v5.2.10 and earlier) Yahoo was used but their service was retired. Imagine you want to show the photos of group members in a page. This macro will help you achieve this easily. It shows profile photos of group members in tabular format for a group. Simply add the macro to a page, provide the group name, and specify the number of profile pictures you want to see in a row. 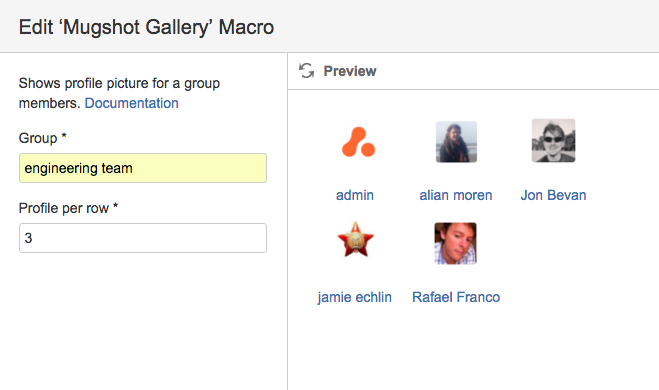 The macro shows first 200 members of a group returned by confluence API. Let’s say as a page author you want to add a page status or information and do not want the information to be removed, modified or viewed by specific users or groups. This is not achievable straight away as Confluence does not support the concept of partial restrictions. Lock Content Macro helps you achieve this by restricting users or groups editing or viewing its content. Simply add the user name in Restricted Users or group in Restricted Groups you want to restrict. The user or the users in the group won’t be able to edit the content of the macro. Additionally, if you want to hide the content of the macro from the restricted users, tick the "Hide Content" box. In the following screenshot all the users in the "painters" group and the user "dali" won’t be able to modify the content of the Lock Content Macro. The macro does not restrict Confluence administrators and space administrators from editing the contents. There are few cases where the macro cannot restrict user from updating its contents. For an example using API it is possible to change a page content. It is advisable to use this macro considering this cases.